I am sure most of us are familiar with the Windows based Operation Navigator tool, and have found that there are certain tasks that are either easier to perform using it or there are tasks within it that there is no "green screen" equivalent. My experience with using it on many different PCs and versions of Windows is that it is slow, a resource hog, and if I do too much with it goes into a "Not responding" status. Therefore, I was intrigued to learn that you can now have access to same navigator-like tools using a web browser. As I do not have an Apple computer I cannot say whether you can use the Navigator on an Apple. The IBM Toolbox for Java no longer exists in 7.1 or 7.2, it has been integrated into 5770SS1 option 3. Now that everything as it should be you open your web browser and enter: http://<your_ibm_i>:2001 in the address bar and press Enter. Note: must be replaced by the name of your IBM i server. For example, if my server is called LIVE400 then the URL I would type would be http://live400:2001 . In my experience the next part is dependent upon which browser you are using. Internet Explorer: I am presented with a screen that states "There is a problem with this website's security certificate", click on the "Continue to this website (not recommended)" link. Mozilla: I am presented with a screen that states "This Connection is Untrusted", click on the "I Understand the Risks" link. Chrome: I am presented with a screen that states "The site's security certificate is not trusted! ", click on the "Proceed anyway" button. Safari: I am presented with a pop up that states "Safari can't verify the identity of the website <your_ibm_i>", click on the "Continue" button. Normally I would not recommend ignoring any browsers security warnings, but as we are attaching to a local IBM i it is safe to ignore the warning. The login screen is self explanatory. And this is what I see after I have logged in. You are now free to explore what the IBM Navigator for i has to offer. As part of the 7.2 announcement IBM stated that the Windows based Operation Navigator will no longer be updated. 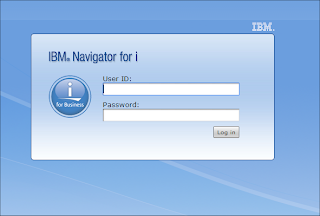 Therefore, it is time to use and become familiar with the new browser based IBM Navigator for i.
Alas, it is still slow on 7.1 . Almost as slow as Ops Nav. It's definitely improving with each and every release Simon. Some of the new stuff included at V7R2 is cool too. Like you say the browser interface makes it more usable than ever. Simon - I work in the IBM i Global Support Center supporting this product. Great article. I noticed a slight typo when it comes to required licensed programs. The HTTP ADMIN server requires 5761JV1 opt. 11 for JDK 6.0 32bit (not option 8 as it is stated). Also, in terms of the relative speed of the product, it should improve as of the latest group PTFs that came out for HTTP (we've included some JVM arguments to turn off IPV6 host name lookups, which has caused performance issues in the past). Thank you for letting me know the error. I have made the correction. Simon, while I encourage & promote the use of Navigator for i, its not entirely true that the installed Windows client will not be updated. The Windows version of Navigator was updated for 7.2 and is enhanced twice per year with high priority Database feature improvements. I realize this is a common misunderstanding and am merely sharing the deeper details because you're doing a great job of promoting IBM i technologies. This is also the site where you can set up an RPG program as a web service. In one of my personal training efforts I worked through a tutorial provided by Scott Klement and I set up an item inquiry web service in the IBM Web Administration link. Then I created a desktop client in java to consume the service. Apologies if this is a duplicate entry (I tried to publish and login at the same time). Looking at the tables in a database for a selected schema I notice it only loads the first 100 tables; the filter appears to only filter what is loaded. The application I support creates various daily interface files that begin with the hash character (#) and there are hundreds of them - the total number of tables in the production library is in excess of 2000 (don't mention housekeeping - it's a sore point). Anyhow, is there a quick way of loading all the tables so I can filter for a selected table or, even better, a quick way of going to specific tables, eg. starting with "C" or "W" ? We are on V6R1 and our PTFs are not up to date - that's in progress but Production is a month or two away from being updated at the moment. When I try to launch this URL, I get an error message that the server refuses to connect. It also redirects me to https://:2005/ibm/console. Any ideas? The URL should be https://servername:2005/ibm/console. My tag was removed by this site. The server name is the name of the partition you are attaching to with your 5250 emulator. If you "ping" the IP address in Windows it will tell you the server name. I work with several clients and I have used IBM Navigator for i. On some systems they have the right license programs and all the right jobs running in subsystem QHTTPSVR, but I still cannot connect. Could this be a port security problem? I think you have made a very good guess as to the cause. Without know your systems' configuration it is hard to give an exact answer. If you are on support with IBM you might want to give them a call. I am sure will have a check list of things to try. Thanks for replying Simon. I discovered the following website that led me to the answer: http://www-01.ibm.com/support/docview.wss?uid=nas8N1019747. Using the NETSTAT *CNN command I discovered the system is not listening on port 2005. I would need to go through all of the steps on the IBM site to fix the issue.